As often happens when a technology sits quietly for years until adopted by Apple, suddenly, it’s grabbing headlines. Almost three years ago, we wrote about the first smart watch that supported so-called eSIM technology, but only now is it becoming widely known — because the iPhone XR, XS, and XS Max support the technology, allowing a virtual SIM to be added to a regular SIM card. How does it work and what are the advantages? Let’s take a look. The first mobile phones had no SIM cards. Instead, they were programmed by a carrier, with the “user account” for network identification stored in the device’s memory. SIM cards appeared in the GSM standard in 1991, allowing subscribers to use their phone on any network and their carrier account (that is, mobile number) with any phone, simply by inserting a piece of plastic with a microchip. For as long as phones and modems were the only devices connected to the network, everyone was satisfied with this arrangement. The only thing that happened to SIM-cards as the years rolled by is that they became increasingly Lilliputian: the mini-SIM (the one we remember as “normal”) was replaced by the micro-SIM, and then the nano-SIM. But the limit has been reached; the nano-SIM is just a microchip with bond pads, without a single millimeter of excess plastic. Now that the Internet of Things is here, with its sensors, smart watches, and other, even tinier devices, even a nano-SIM slot is an inadmissible luxury. 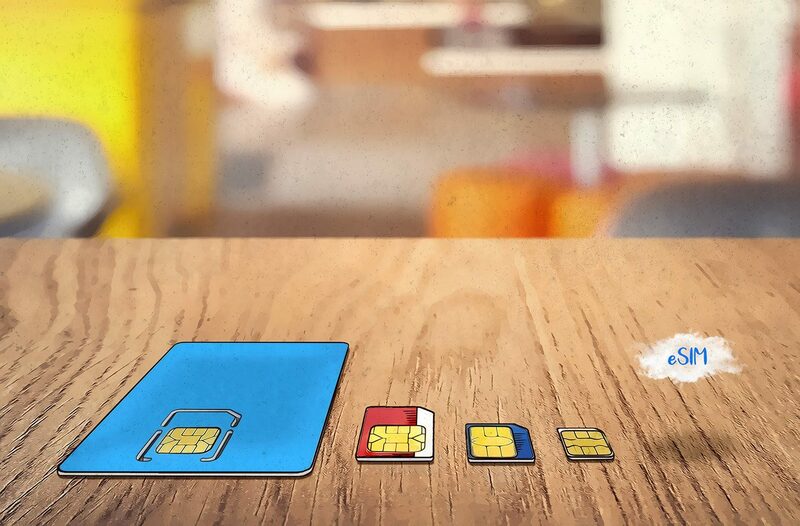 Enter the eSIM, a built-in SIM card. At first glance, it seems to mark a return to programmable phones. However, this evolutionary microchip (approximately 5×6 mm, a fraction of the size of a nano-SIM) not only stores subscription data, but also can be downloaded over the air, remotely. Practically speaking, that means no need to manually insert SIM cards into tens of thousands of parking sensors or street-light control modules, or reorder a whole batch of cards when changing operators. Turns out, eSIM technology is great not only for smart gadgets, but also for selling SIM cards for phones remotely. Carriers save money on start packages, renting retail space, dealers’ fees, and so on, and the paying public saves time and effort by not having to go to a store or wait for a start package to arrive. It is also perfect for travelers looking to avoid roaming charges. Purchasing the right plan online and downloading it straight to your phone is a lot simpler than getting one abroad in a store, especially if you don’t speak the language. Actually, eSIM technology has both advantages and disadvantages, at least for operators. Sure, it simplifies the sale of services, but it also makes it easier for customers to move to competitors. At present, there is some lag between ordering a new SIM card and receiving it. With an eSIM, you can get an activation code much quicker. That makes the transition easier. Operators certainly don’t want you to leave them with such ease. Second, in most Western countries, smartphones are contract-based, which means that they are tied to the operator that sold them and work only with SIM-cards issued by that operator. Apple is now disrupting the entire ecosystem by handing the initiative to device manufacturers and prodding operators to develop online sales. Residents of mainland China, one of the biggest markets for Apple, too, will not have a chance to try out eSIM technology for the time being. According to information on the Apple website, instead of an iPhone with a built-in eSIM, in China models will be sold with two nano-SIM slots. Likewise, new devices in Hong Kong and Macau will feature two removable SIM cards. Actually, the eSIM will also be available there, but only on iPhone XS smartphones. Currently, eSIM for iPhone is provided by mobile carriers in most of the European countries, as well as Canada, Qatar, Singapore, Taiwan, Hong Kong, Thailand, UAE, India, Kuwait, and the US. “Tourist” SIM cards can also be purchased from the international operators Truphone and GigSky. For many, travel SIMs are in fact the only way to try out eSIM for the foreseeable future. In the handful of countries where operators support eSIM functionality, such services are available only to local residents, and not on locked phones (that is, ones tied to a particular carrier). Connecting a virtual SIM card is not complicated. All the subscriber needs to do is scan a QR code generated by the operator, or manually enter the following parameters: SM-DP+ (Subscription Manager Data Preparation) server address and activation code. The operator will supply them. The SM-DP+ server is the place where the subscriber profiles are generated, and the LPA (Local Profile Assistant) program on the device requests the relevant profile and loads it into the eUICC (embedded Universal Integrated Circuit Card) — the microchip in which this profile is subsequently stored in encrypted form. The eUICC is also used for network authorization. What’s more, it can host several SIM profiles simultaneously, with a memory capacity of 512KB versus 64 or 128KB in traditional SIMs. This allows users to switch between virtual SIM cards. In the new iPhone, this is done by tapping Settings -> Cellular -> Cellular Plans. As you can see, despite all the abbreviations, there is nothing difficult about connecting an eSIM. We think owners of the new iPhone should give it a try — and if the technology is not yet supported in your country, you can still purchase a virtual SIM card when abroad.